We are always on the hunt for authentic ingredients and cuisine. Living in a mid-sized Southern city has posed its challenges in the past, but as the Holy City becomes more popular, its offerings expand. Hence Kimchi. 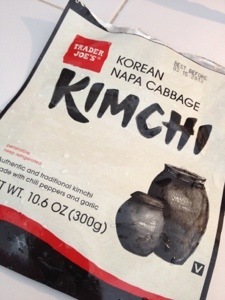 Many of you, I know, will cringe and profess, “Kimchi?? Ew, gross!” Too bad for you. Ken has decided that the best kimchi is made in Korea. Um, that does make sense since it is Korean. We have tried versions from New York City, and even some homemade in Charleston by different purveyors that offer otherwise great food. The best yet? Trader Joe’s. We thought it would be middle-of-the-road bland. Nope, it’s the real thing.